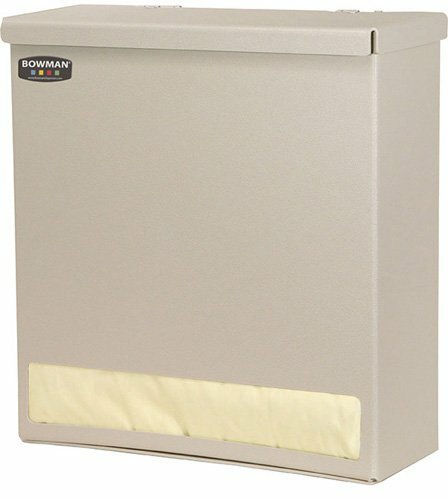 BOWMAN GN001-0212 Gown Dispenser, Bulk, 15.12" Height, 14.70" Width, 5.04" Length. BOWMAN GN001-0212 Gown Dispenser, Bulk, 15.12" Height, 14.70" Width, 5.04" Length. Most standard-size flat-pack gowns - approximately 1 package (quantity varies with type of gown). Gown Dispenser - Bulk. Holds a wide variety of gowns in bulk quantity. Hinged lid with opening at bottom of unit. Keyholes for wall mounting and cut out for door hanger. Made of quartz ABS plastic. . Gown Dispenser - Bulk. Holds a wide variety of gowns in bulk quantity. Hinged lid with opening at bottom of unit. Keyholes for wall mounting and cut out for door hanger. Made of quartz ABS plastic. . Manufacturer: Bowman Manufacturing Company, Inc. Publisher: Bowman Manufacturing Company, Inc. Studio: Bowman Manufacturing Company, Inc. If you have any questions about this product by BOWMAN, contact us by completing and submitting the form below. If you are looking for a specif part number, please include it with your message.